A hashtag (#) is a popular way of creating and monitoring a conversation on social media. While most often identified with Twitter, posts can also be tagged on Instagram, Pinterest, Google Plus, and Facebook. The most popular hashtag for healthcare social media on Twitter is #hcsm. Hashtags are a useful way to find others who share your interest in health related topics, but did you know that you can do so much more with them? 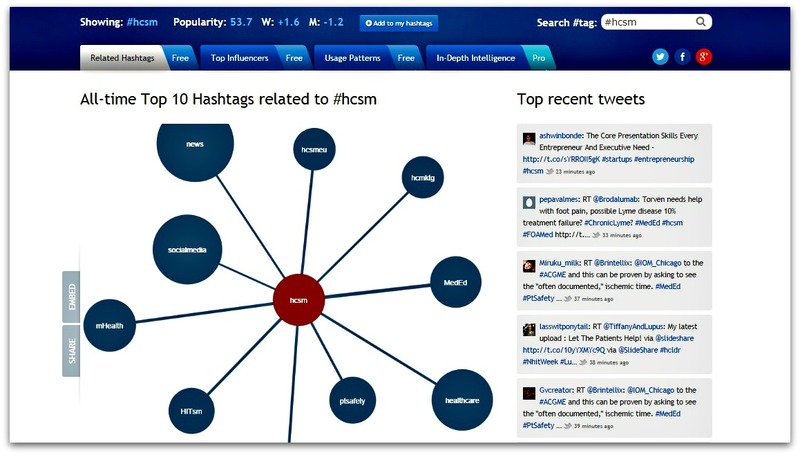 Analysis of hashtag data allows you to track, measure, manage and grow your social strategy. Connect with existing conversations and people who are tweeting about healthcare. With this data, you can identify healthcare trends and key influencers. Create more effective healthcare campaigns by measuring the level of interest, sentiment (“positive”, “negative”, or “neutral” attitudes), key demographics and influencers of your healthcare campaign. Use the findings to plan future campaigns. There are a number of hashtag analysis tools at different price points. Most will allow you to try out a limited search for free, but for more detailed results, you will need to sign up to use the paid features. 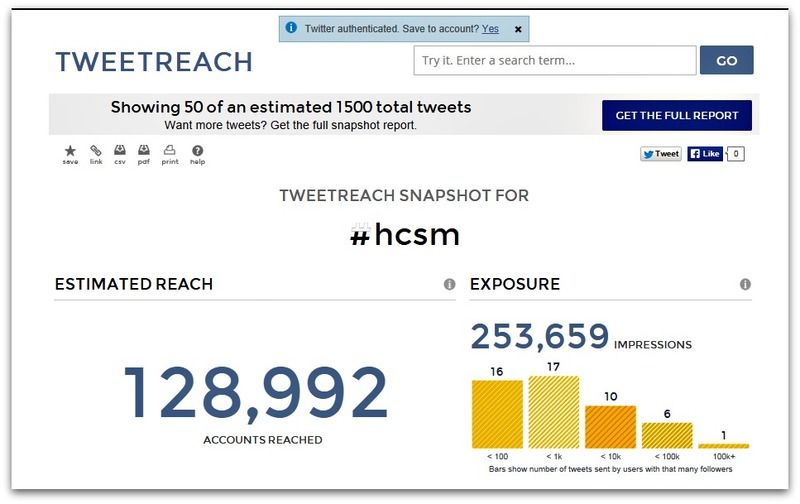 The following list includes both free and paid options and where possible, I have provided a snapshot of the #hcsm hashtag to illustrate the features of each tool. Hashtagify helps you find out the volume of a particular hashtag, related hashtags, recent tweets with that hashtag, top influencers and usage patterns, for free. For more in-depth analysis there is a paid version. Hashtracking provides detailed analytics based around any hashtag, in any language, you want to track over the past 30 days. It includes embeddable charts and graphics, as well as numbers of tweets and retweets, reach, influencer analysis and impressions. Use it to track different hashtags to find out what is trending, and what power each one has. If you want to explore how it works without committing to a paid version, start with their free to use Hashtag Explorer tool that you can use for quick searches. For more detailed analytics and results, you can sign up for a free trial and start tracking your hashtag campaign right away. Keyhole is a real time social tracking tool that you can use to track campaign hashtags, keywords and URLs. You can choose to search through Twitter, Instagram or Facebook, one at a time or all together. You’ll be able to see a list of recent posts, the number of posts, as well as reach and impression, top sites, a list of the most influential users and demographics and location analytics. 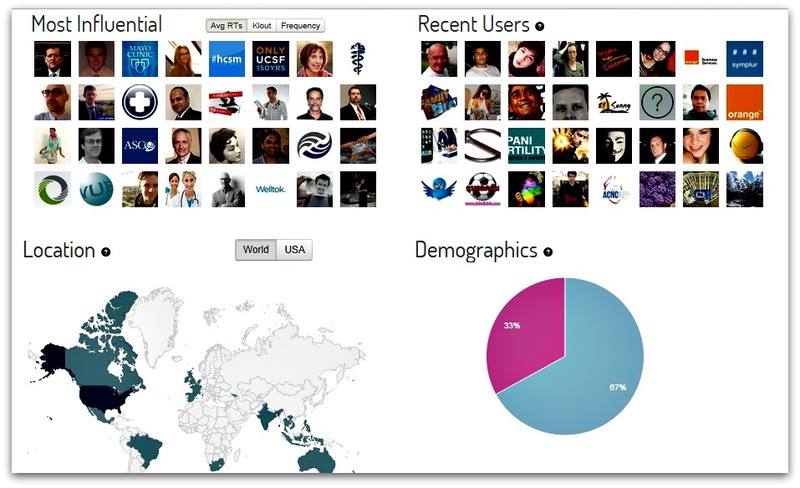 Social Mention is a free real time social media search and analysis tool. Use it to search for health related hashtags, track sentiment, lists of top keywords, top users, top hashtags, and the main sources of mentions. With a focus on big data crawling, the Talkwalker search index is one of the largest, covering over 150 million sources in 187 languages and 247 countries. 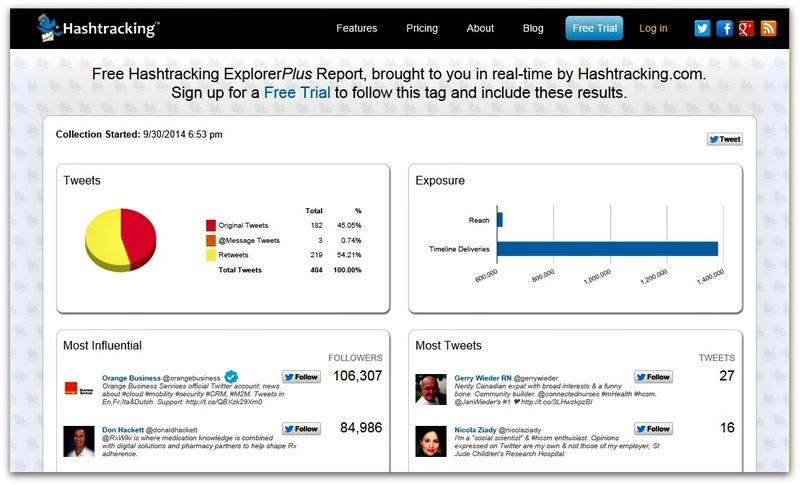 It was rated one of the top 5 best social media monitoring tools and online reputation management tools globally in 2013. The free Talkwalker Alerts launched in March are a preferred replacement of Google Alerts to receive free notifications by e-mail or RSS feed. Tweet Archivist uses real-time services provided by Twitter to search for tweets and hashtags. Data is updated hourly. Bear in mind that Twitter only allows access to roughly the last 2000 tweets of a search or a week of tweets, whichever comes first, so this service cannot provide you with an historical archive of tweet. See how far your message has travelled, which tweets get the most traction and who’s influencing the conversation by searching for your hashtag on TweetRreach. Among the features listed on the Twitonomy website, you can get detailed and visual anyalytics on keywords and hashtags, top related hashtags, an interactive map, a list of the most influential users, export tweets to Excel, track clicks on the links in your tweets, and track the evolution of a particular hashtag over time. Do use hashtags as a discovery tool to find out what people are saying. Don’t use too many hastags. Placing too many hashtags in your tweet is visually unappealing; limit yourself to two hastags per tweet. Do use hashtags that are relevant to your field. 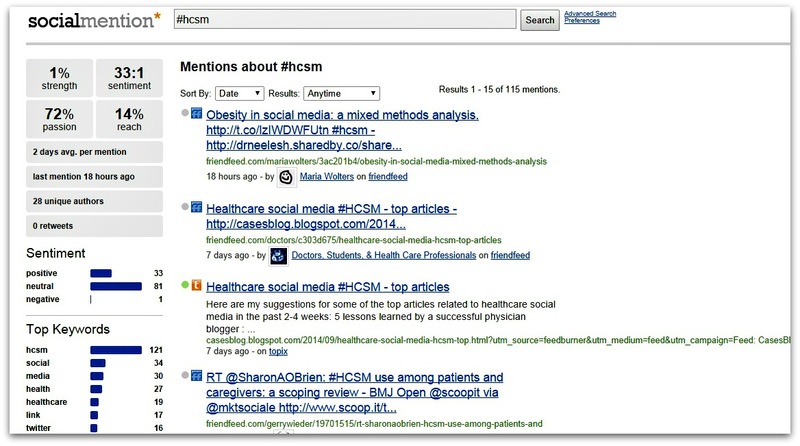 Check Symplur’s Healthcare Hashtag Project to find the most commonly used Twitter hashtags for the keywords you want to search. If you are starting a new hashtag RiteTag will streamline the process of finding the possible hashtags for you. RiteTag have just released a new feature called RiteTag Composer which provides instant real-time hashtag reach analysis – worth checking out. Don’t spam people with your tweets when they are not about the topic they want to read.